The admission of new securities to the Stock Exchange official list. The organization of exchanges and the quotation of securities under the best conditions of fairness, safety and transparency. The dissemination of exchange information. To be the driving force behind changing attitudes towards financial matters in order to make Stock Exchange saving an integral part of the practices of savers and to ingrain Stock Exchange financing in the managerial culture of Tunisian companies. To constitute an essential part of the financial economy of Tunisia. To be the right way for Tunisian companies to achieve their ambitions for rapid growth and improvement to reduce the delays in their development and their internationalization. To participate in the widest possible dissemination of the culture of transparency and good governance. To participate in Tunisia’s regional outreach. A favorable economic and social environment: a solidly based economy with promising prospects, sound macro-economic management, controlled inflation and the tranquility of social stability. A modern legislative and regulatory framework in compliance with international standards. A reliable settlement-delivery system meeting the international standards with settlement day+3. A system which guarantees the settlement of transactions. Professionalism, financial strength and integrity are required from the market operators to guarantee the interests of investors. Only approved brokerage firms conduct the negotiation of securities. The Company of deposit, clearing and settlement of securities (Tunisian Central Depository) ensures payment in cash and the delivery of securities. The Market Guarantee Fund intervenes between the brokers to guarantee the settlement of transactions. The Financial Market Council, as a body controlling the market, oversees the protection of the investors and the good functioning of the Stock Exchange markets. The OTC market is open to the securities of pubic shareholding companies not admitted to the Stock Exchange official list. Liquid and long- term remunerative investments. Permanent valuation of the capital. Tax exemption on dividends and capital gains. Tax exemption for the holders of a “Savings Account in Shares. The status of shareholder and co-owner of renowned companies. Leverage of capital directly from investors, at a lower cost. Strengthening the reputation and the brand image of the company. Tax exemption for the five years following introduction in the Stock Exchange. Continuity by the facilitation of the transmission. February 1969: Establishment of Tunis Stock Exchange as public institution. November 1994: Reorganization of the financial market which separates the functions of control and management of the Stock Exchange market. 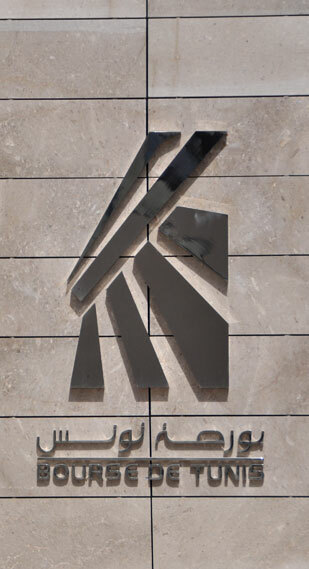 November 1995: Creation of the Tunis Stock Exchange, a limited company held by the brokers, 24 in total. October 1996: Set up of the trading electronic system NSC. April 1998: Launch of the TUNINDEX index (Base 1000 in December 31, 1997). December 2007: Launching of the Alternative Market, for small and medium-sized companies, the upgrade to the latest version of the electronic trading system V900. May 2009: Creation of Clients Guarantee Fund. December 2010: Relocation of Tunis Stock Exchange to its new headquarters. January 2012: Launch of the index "TUNINDEX20" (Base 1000 in December 31, 2006). Sepember 2012: Launch of the "Stock Market Education and Culture Program". November 2012: Launch of the "Stock Market and Financial Serevices Show -Investia-".